You can find just about any information you could ever need on the Internet these days. From the technical to the obscure, there are numerous websites for any topic you can think of. This is why it makes good sense to use the Internet for researching the options, styles, and features that you’ll find when looking for new accessible vans. There’s a lot of information you’ll want to know about when you start looking around for a new accessible van. Before you shop, you should know exactly what you’re looking for and be able to converse with the dealer about the van right down to the finest detail. 1) Find out where the best places in your area are located. This one is crucial. Trust me, I’ve heard way too many horror stories from people who’ve had a bad experience with a dealer—especially when buying online. After all, not every car dealership will have accessible vans in stock. And those that do may not be very knowledgeable about them. You want to find a dealer that knows accessible vans just as well as they know traditional vehicles (most don’t). They should know all about the conversion process and understand and which features and options are going to be best for you. 2) Consider the size of your wheelchair, the number of passengers you may have at any given time and whether or not you’ll be doing any driving. All of these will factor into the size of the van you will need. 3) Get educated on the latest models and styles of lifts, ramps, and electronic controls. This can save you a ton of time once you actually go into the showroom. 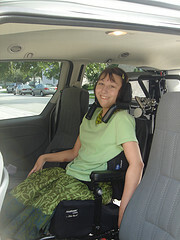 4) Go to social media platforms like Facebook or Twitter to ask people in your area what their experience has been like in locating a new accessible van for sale. There’s nothing like getting a personal account of a dealership’s service and dedication than from someone that has been there themselves. In many cases, you may find accounts for dealerships that will answer some of your questions right away. Armed with this knowledge, you should be able to shop for a new accessible van in confidence. Just make sure you are comfortable with the van and that it meets all of your daily needs and recreational activities. Accessible Technology: Yahoo, Google, Apple, Oh My!